"...I Promise Never To Lower The Standard Of The Galactic Patrol." SF NEW CENTURY LENSMAN dazzled with state of the 1984 art techniques and a heroic pulp-fiction pedigree, but left behind only VHS tape and a few well-designed toys. In its wake Western SF readers were nonplussed with the film’s changes and Japanese animation fans looked at contemporaneous anime movies like Nausicaa and Macross: Do You Remember Love and found Lensman lacking. Six years later Lensman received a North American release and audiences found its computer animation dated, its quasi-Star Wars story thin, and compared with Akira, Ninja Scroll, or god help us, Legend Of The Overfiend, it was dismissed. 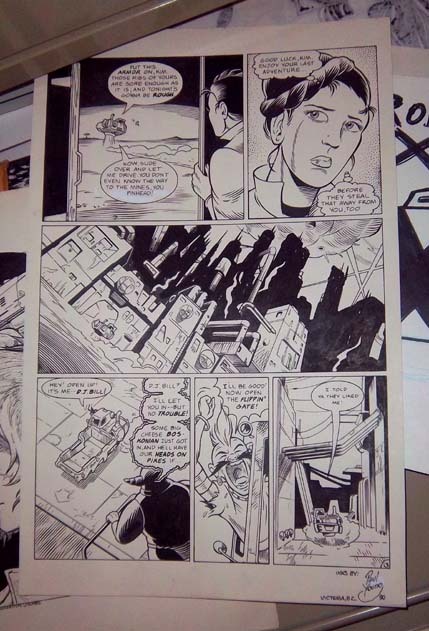 But can we just toss SF New Century Lensman onto the cartoon junkpile? Sure, it’s a wannabe Lucasfilm sprinkled with car-ad CG that freely adapts nickel-a-word pulp written back when “a computer” was a guy with an adding machine and a green eyeshade. But when the film’s allowed to give us a galaxy of minutely-detailed space-hoppers zipping around gorgeously detailed alien worlds, when Worsel, the dragon Velantian Lensman, blasts Kim Kinnison and Van Buskirk out of the terrible grip of the hideous Catlats, when Kim’s DeLameter ray-pistol flares with the scintillating force characteristic of the Galactic Patrol’s most powerful hand-weapon, when the Kawajiri direction overwhelms the plot holes or the big chunks of empty space left in the film for somebody in New York to finish via ‘computer animation’ – well, friends, it’s to Civilization’s benefit that the parts of Lensman that are good are very good indeed. 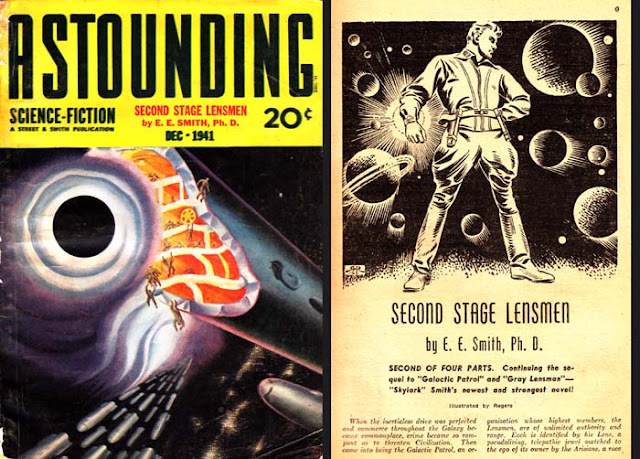 When Edward Elmer “Doc” Smith, PhD, introduced the Lensmen in “Galactic Patrol” as a six-part serial starting in September ‘37’s Astounding, he moved space opera beyond the interstellar stage of his previous “Skylark Of Space” and into realms galactic and eventually inter-galactic. Space drives, force fields, anti-matter spheres and thought-screens became brushstrokes on Smith’s canvas, using the Lensman stories to illuminate a sprawling, eons-spanning saga of two diametrically opposed cultures using entire civilizations as weapons. Smith’s epic continued through the serialized novels “Gray Lensman” (1939), “Second Stage Lensman” (1941) and climaxed in 1947’s “Children Of The Lens”, while a 1934 work, “Triplanetary” would be retrofitted into the Lensman continuity in ‘48 and 1950’s “First Lensman” would fill the gap between it and “Galactic Patrol”. His work would be in print for decades, and after his death several authors would continue the Lensman universe in companion novels of varying quality. 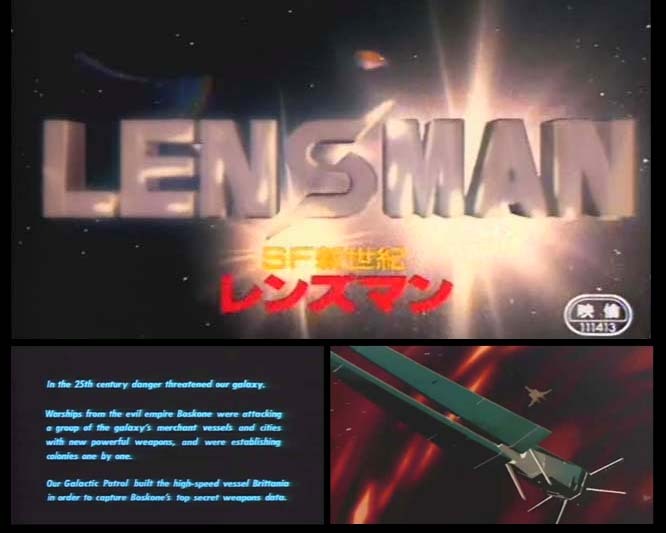 Lensman first appeared in Japan in 1969 with Kaiseisha’s “Masterpiece Animated Picture Story” series adaptation of Galactic Patrol. 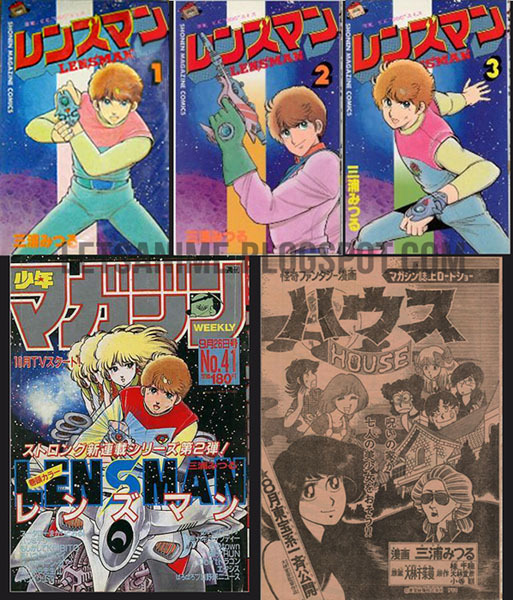 Subsequently, the full Lensman series would be published by in turn by Shueisha, Akane Shobo, Poplar, and Kodansha. As the 80s anime boom echoed across Asia, Kodansha/Toho/Towa might have seen adapting American SF had worked well for Toei’s Captain Future (originally by Edmond Hamilton) and in live-action for Tsubaraya with Hamilton’s Starwolf. 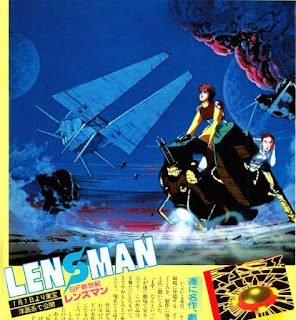 It’s clear somebody in Japan was into the Lensman; apart from its extensive Japanese publishing history, the Lensman world had just been used as the basis for one of my all-time arcade favorites, Namco’s 1981 space-shooting video game Bosconian. 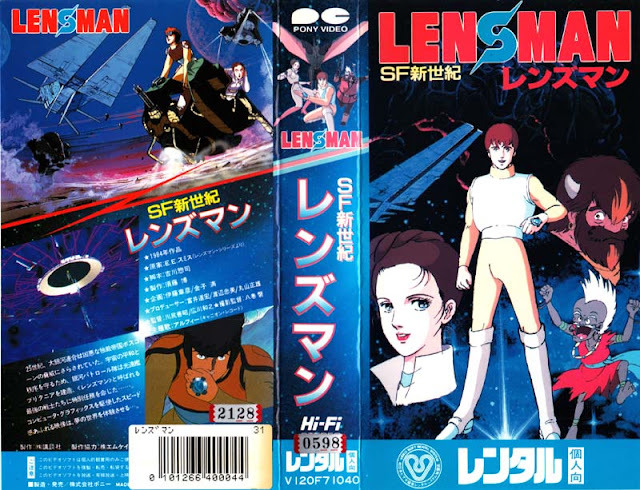 SF 新世紀 レンズマン SF New Century Lensman – or “SF New Wave Lensman” according to the toy boxes - was released by Toho-Towa in July of 1984. Produced by MK/Madhouse for Kodansha, the film was directed by future Ninja Scroll auteur Kawajiri and SSX/Baldios helmer Kazuyuki Hirokawa, and would be inescapable for the next few months in theaters, bookstores, toy stores, and TV screens as a stylish, shiny, computer driven media juggernaut that became, almost instantly, an artifact of 1980s aesthetics. How does this animated film stack up against its pulp-fictional ancestor, itself emblematic of its own era? E.E. 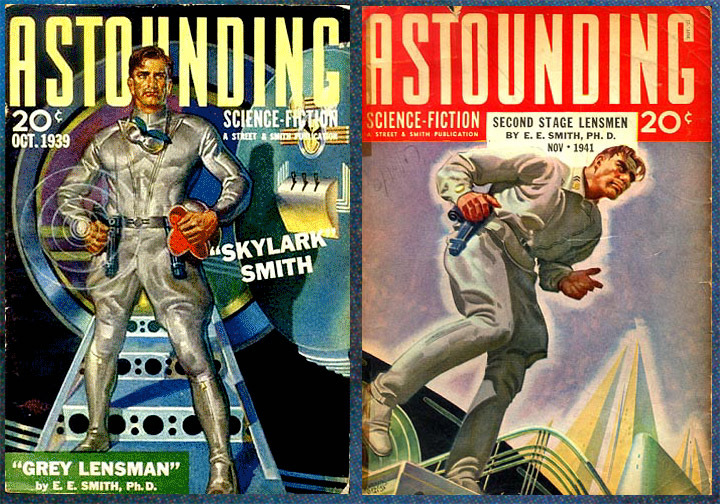 Smith wastes no time world building in 1937’s Galactic Patrol. Hell, he doesn’t even tell us what year it is. We’re dropped right into Galactic Patrol Graduation, as the best and brightest of the best and the brightest become unstoppable outer-space military policemen, known across the stars by their symbol of truth and justice, the Lens. As top of his class, our hero Kimball Kinnison is automatically volunteered for a dangerous mission; take the GP’s new supership Britannia and capture a space warship of the enemy, the piratical Boskone. 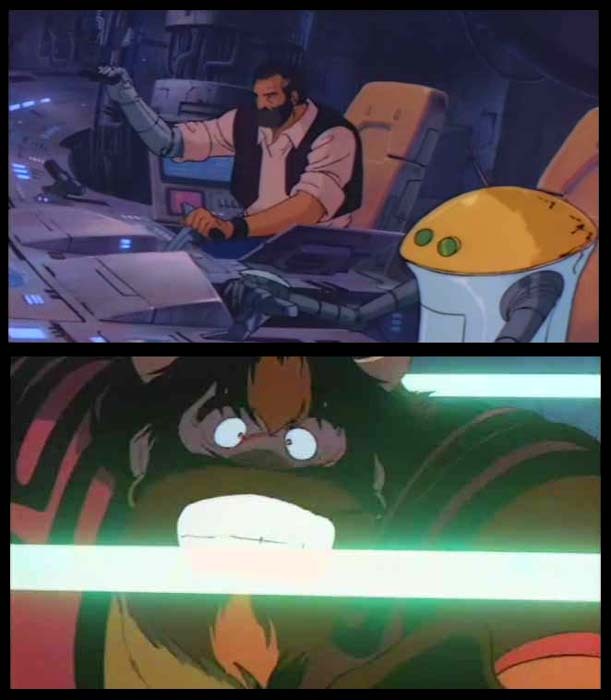 Meanwhile in the 1984 anime version, Kim Kinnison is Luke Skywalkering it as a young farm boy on a backwards planet, enjoying a bucolic lifestyle with his dad and robot pal “Soll”, as his dad’s old friend, the bullish, bearded Van Buskirk, arrives in his junky spaceship to give him a lift to Space Academy (Saturdays on CBS). This charming family scene is interrupted as the GP battleship Brittania (sp) crash lands in the middle of the soybean crop, straight out of the film’s opening sequence, itself an eruption of hideous Boskonian brain-vessels and shiny computer-generated Galactic Patrol ships. Stumbling out of the Brittania is a Lensman, a character so important the film doesn’t bother to give him a name. In this nameless, mortally injured Lensman’s Lens is the secret to destroying the Boskone headquarters. Who can assume the Lens and deliver this vital data to Galactic Patrol Prime Base? Why, Kim Kinnison can. Kim’s given the Lens in a scene full of scintillating energy rays and exquisitely detailed CG that has infuriated fans of the literary Lensman ever since. 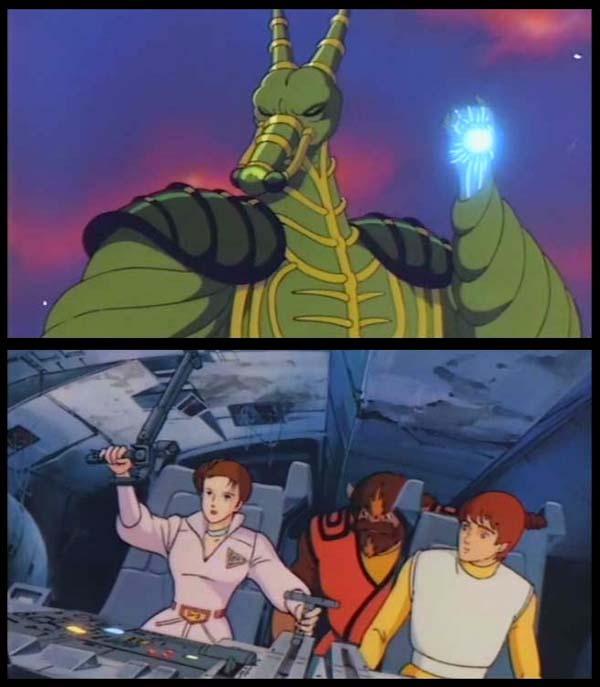 EVERYBODY, even the most brainless Zabriskan fontema, knows the Lens is ONLY bestowed upon the most worthy of sentient beings after a thorough mental investigation by Mentor of Arisia! This sort of departure from the source material exasperated “Doc” Smith fans and Smith’s family/executors, which didn’t have script approval and weren’t and maybe still aren’t happy with the finished film. And sure, they have a point. However, for many fans of a certain age (myself included), the anime Lensman was their first exposure to the world; their doorway to a lifetime of enjoying Smith’s works from Lensman through Skylark and right on to his masterpiece, Spacehounds Of IPC. The two Lensman works aren’t fundamentally at odds; many story beats from Galactic Patrol are given a workout in SF New Century Lensman. In both versions our heroes escape the doomed Britannia in space lifeboats, both feature Kim and Van Buskirk battling the horrifying tentacled Catlats and being rescued by their new pal Worsel, the dragonish Velantian Lensman. Our heroes face the snail-like and frankly disgusting Overlords Of Delgon in both iterations. In each, Kim faces grotesque alien menaces, is soundly beaten, and is nursed back to health by Clarrissa "Chris" MacDougall, top GP medico and inevitable Kinnison love interest – I say inevitable because she is the only woman to get any lines, in either the film or the book. 30s pulp fiction is kind of masculine, to say the least. Sure, much in Galactic Patrol gets shifted around or ditched outright by the film. For instance thionite, the addictive drug sapping the vital strength of Civilization, is mined on Radelix in the film, but in Smith’s novel is harvested from plants grown in the bizarre environment of planet Trenco. The anime Radelix is a frontier mining planet where our heroes Kim, Chris, and Van Buskirk reunite after escaping the doomed Britannia. Radelix’s only entertainment is a zany disco populated by disco-dancing aliens and DJ’d by the diminutive, elderly, mohawked Wild Bill, dropped into the film without explanation to help hide Kim and Chris in enemy territory. Radelix Base, the narcotics linch-pin of Boskone’s vice campaign, is dealt a serious blow when Kinnison and Van Buskirk go on a high speed scooter bike chase through the planet’s thionite processing plants, leading to lots of the kinds of explosions we’ve come to expect from Japanese animation. Certainly a livelier Radelix than is seen in the novel. Smith’s Galactic Patrol ignores Kim Kinnison's youth, home town, quirks, preferences, or idiosyncrasies - he's merely Kinnison of the Galactic Patrol, possessed of driving will and herculean strength, chain lightning with his ray-pistols, parenthetically endowed with whatever martial arts skill or science know-how required by any situation. SF New Century Lensman’s Kinnison is a sharp departure from this in pretty much every aspect. Inexperienced in the ways of outer space and The Lens, he is a fresh-faced hayseed tricked out in what appears to be a space onesie, a callow youth fumbling his way through traps and monsters a rougher, tougher literary Lensman would handle easily. On the other hand, the animated Kinnison displays human emotions and has a life beyond Galactic Patrolling, definitely something the textural Lensman lacks. The Lens itself is, if not a wholly different beast, certainly introduced differently. In the novels the Lens is identifying badge and mental communicator, giving top-notch Galactic Patrolmen a unique, un-copyable symbol of office and allowing them to communicate instantly with any being anywhere in the Universe. Potential Lensmen must voyage to the mysterious planet Arisia, where the ancient, mentally omniscent Arisians bestow individual Lenses upon the worthy. Those not measuring up are prohibited from even approaching the planet. Use of the Lens allows Kinnison and other Lensmen to read minds and, after Second Stage training, mentally control the will of others, leading to an arms race of thought-screens and thought-screen-blockers and thought-screen-blocker-piercers throughout the novels. In the film, however, the Lens is a vaguely explained ESP amplifier/ USB drive capable of telepathy with aliens, parrying mental beams of force, and delivering vital military information to Galactic Patrol Headquarters. Not outside the boundaries of what we see in the novels, but a Lens passing from one Lensman to another is strictly contra regs, as Kinnison would say. One man, one Lens; that’s the rule. The film's lumpy, chitinous, segmented monster Boskonians resemble the enemies seen in later Lensman novels; the Eich, the Ploorans, and other extra-galactic races of poison-breathing monsters ruled by brutal each-against-all law of the strongest, all the way up to the Supreme All-Highest of the planet Eddore, whose mental powers are matched only by the Arisians. The struggle between Civilization and Boskone is just the latest in a series of proxy wars waged between Arisia and Eddore, each manipulating races, planets, and cultures. Backstory of this dimension is hard to cram into a film that clocks in under two hours and has a lot of computer animation to show off, and SF New Century Lensman sidesteps the whole business by never bothering to explain who Boskone is and why it's at war with Earth and/or Civilization. What the film lacks in scriptural fidelity, it makes up for in visual spectacle and intricate, well-designed world building. Boskone’s alien confederation of segmented monsters contort, glow, and deliver a well-designed otherworldliness to the film. Worsel, the winged Lensman from planet Velantia, is wonderfully alien yet expressive, and Van Buskirk fills the novel’s requirements of a rough and ready Space Viking while also delivering needed comic-sidekick relief. The Radelix thionite factory hosts a tremendously destructive chase involving speeder bikes, bazookas, searchlights, hapless guards, ray guns, pipes, railings, spaceships, and explosions; lots of explosions. It's a viscerally satisfying sequence that overwhelms the remainder of the film. The movie climaxes with Kim wandering through a computer-animation demo, rescuing Clarissa several times, and exchanging mental lightning blasts with the Boskonian big cheese Helmuth. The fleshy architecture of the Boskonian base melts away in Cronenbergian body-horror style and Galactic Patrol's space fleet zaps at Boskonian brain-ships in a tedious counter-example to the Radelix speeder-bike sequence. And that's a real missed opportunity; Smith's Lensman is full of sequences where fleets of starships blast each other with immensely powerful rays, defensive screens, zones of force, and penetrating helixes, all described in flowery “Doc” Smith terms. Seeing these pulp-fiction star-battle physics depicted on the big screen would be terrific - in spite of decades of Star Wars and Star Trek films, no Hollywood movie has approached it – but here Japan's Lensman drops the ball. To its credit, the film nails Smith's conception of the command and control system necessary for fleet action on a cosmic scale - "the tank", socially the “Directrix”, technically the Z9M9Z, a giant visual real-time representation condensing the movements of countless units into understandable representative icons. This conception was unique in SF of the time, and would later be the basis for US Navy command-and-control systems during World War II. And yes, there is a lot of computer animation in this film and no, it hasn’t aged very well. When delineating shiny, sleek GP warships escaping Boskone’s ugly cruisers via hyperspatial tube, or for trippy mindscape sequences illustrating the limitless potential of the Lens, the computer animation offsets the traditional animation to good effect. 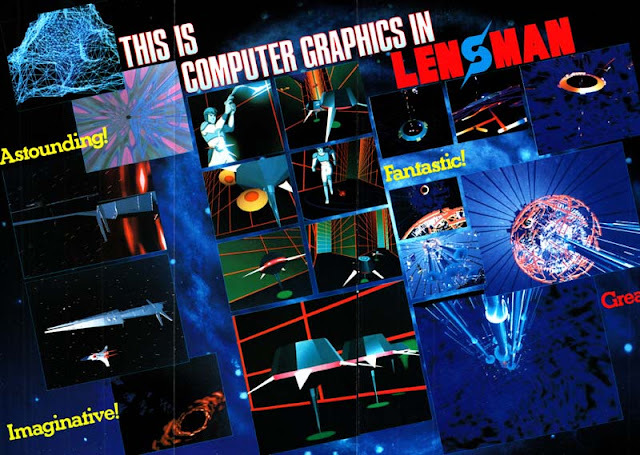 If our eyes hadn’t since been overwhelmed by decades of surrealistic computer animation inserted wherever possible, Lensman’s computer effects might still impress. The film's CG was by "Computer Graphics Laboratories, Inc", a pioneering production company created by the New York Institute of Technology's Computer Graphics Lab to produce purely commercial work for clients including Volkswagen, Lincoln Center, and Chevrolet. However, the shiny, slick, swooping-camera look of CG was already becoming a cliché when Lensman was in production and certainly by the time the film made it to America, the fad inspired shrugs rather than awe. That’s the price early adopters sometimes have to pay. SF New Century Lensman’s music has held up nicely, however; the film’s soundtrack perfectly matching the futuristic science-world of the visuals. Fusion composer (and Pink Lady keyboardist) Kan Inoue’s instrumentals are big, evocative and vibe-heavy, while folk-rock powerhouse The Alfee throws down a big chunk of ethereal, harmonic space-rock with the film’s theme “Starship”. My personal favorite piece of Lensman music remains the TV show theme by Eri Kojima, “On The Wing”, which asks us to “give peace a chance tonight”. Another outstanding element of the Japanese Lensman is the excellent mechanical design, which sponsor Tomy faithfully rendered into an engaging line of great toys. The Britannia II toy is especially prized; twelve inches of high-tech plastic with gun ports that flip open and fire missiles, a landing craft that itself launches smaller landing craft, and a Q-Gun that pops out of a secret hatch and fires a ball that rolls really, really far before you lose it. Remember to take your AA batteries out after playing with your Britannia II, or some terminal corrosion may occur. Tomy’s Lensman line included spaceships, model kits, blow-up Boskonians, and a toy Lens that fits on your wrist just like the real Lens that you don’t even have to go to Arisia for. The SF New Century Lensman film was followed by a television series titled “Lensman: Galactic Patrol.” It begins, as most Lensman novels do, by describing the collision of galaxies that led to Arisia and Eddore. In many ways the TV show is closer to the novels; characters like the Rigellian Lensman Tregonsee, Commandant Hohendorff, Surgeon-General Lacey, and Arisia’s Mentor are seen for the first time. On the other hand, the show diverges from canon at will, giving Kim’s robot pal Soll a major sidekick role and portraying Kim as the first-ever Lensman. However, the series wins serious old-school credibility early on by throwing us a future-prediction plot point right out of the novel First Lensman. 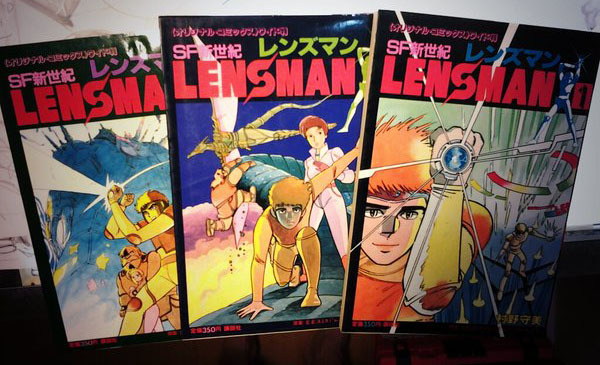 Japan’s comic book Lensman adventures were a different, less constrained story. Prolific manga artist and animator MoriBi Murano, whose work includes Unico, puppy adventure “Hoero Bun Bun” and designing characters for Dagger Of Kamui , worked his sketchy, demonstrative pen line in a Lensman film-adaptation manga that was published in three volumes. 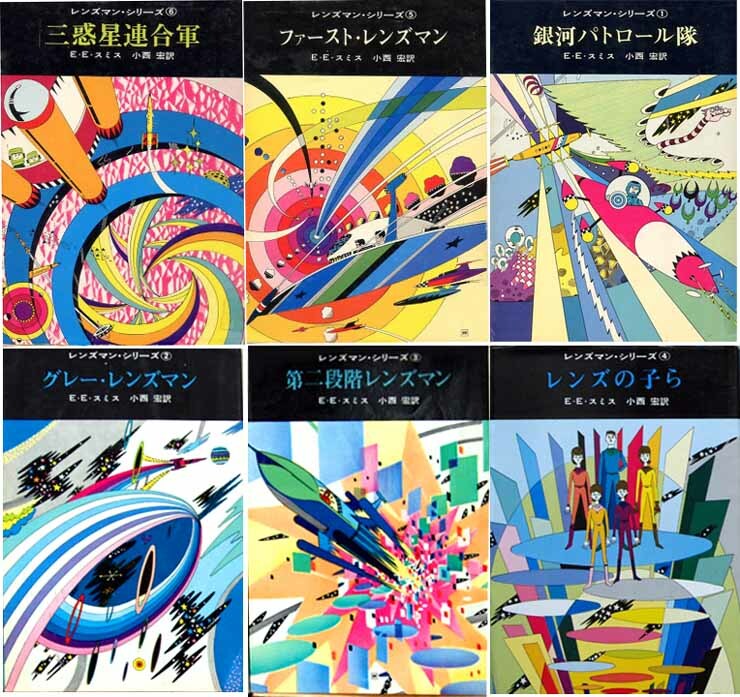 Murano was born in Manchuria when it was still Manchuko, was disabled in a childhood accident, and sadly passed away in 2011, leaving a legacy of hundreds of manga works. 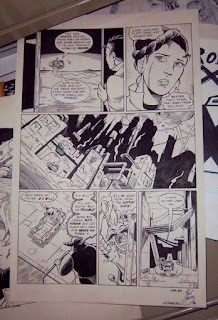 Subsequently the TV series received its own Weekly Shonen comic adaptation. 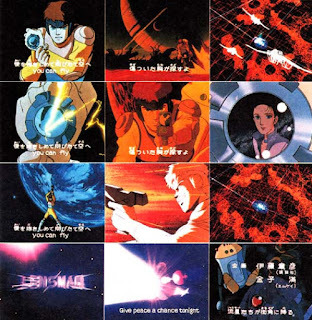 Mitsuru Miura’s Lensman was based roughly on the television series but sparkled with Miura’s own wide-eyed charm. You may remember Miura from his popular romantic comedy The Pumpkin Wine, or his manga adaptation of the crazed 1977 horror-comedy Hausu(?!!). In Japan the feature film and some of the TV series was released on VHS. The feature film appeared on LaserDisc. And then SF New Century Lensman was over. What happened? Was Kim Kinnison not as appealing as other anime ESPer prettyboys like Justy or Locke The Superman? Did the anime boom fizzle out at just the wrong moment? Were anime space-opera fans merely biding their time until the release of Legend Of Galactic Heroes? Was it merely one more summer anime movie meant to divert audiences and sell toys and be forgotten? Lensman settled into comfortable retirement on the shelves of used bookstores everywhere, until 2008 when Ron “Opie” Howard’s Imagine Entertainment and Universal Pictures optioned Lensman for a feature film, with J. Michael “Babylon 5” Straczynski reportedly attached to write. However, in 2014 Straczynski said Imagine/Universal had passed on the project and the rights had been allowed to revert to the Smith estate. 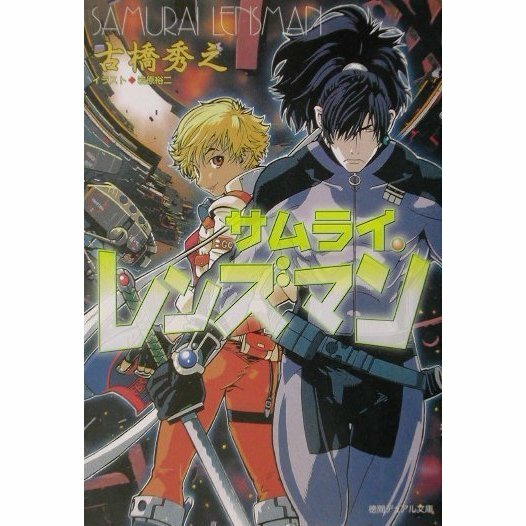 Meanwhile in Japan, author Hideyuki Furuhashi continues the Smith tradition with his novel “Samurai Lensman”, the story of a sword-wielding Gray Lensman battling the rebirth of Boskone. We may never see another filmic adaptation of Lensman. But the one we have remains a film that entertains, whether you’re upholding the standard of the Galactic Patrol or whether you’re just looking for well-designed spaceships blasting the heck out of Radeligian thionite factories while The Alfee harmonizes and the mental waves of Second Stage Lensmen echo throughout the galaxy. It’s a film that deserves a 21st century high-definition rescue, not only for its own cinematic sake, but also for the universe of E. E. “Doc” Smith’s pulp-fiction adventure that this film drives readers towards, as inexorably as a full battery of cosmic-energy-powered tractor beams, as unstoppably as two inertialess planets smashed directly into the Boskonian base of Jarvenon, and with all the overwrought linguistic energy of a early 20th century writer envisioning all of macro-cosmic space, while still being paid by the word.